← Window Woes and other Concerns! I don’t know about the rest of you but I often have “me to I” talks as I work by myself! Constantly asking: “What was he thinking as he was working on this building?” Again, don’t get me wrong, I feel very blessed to have been able to purchase a home that already has a free standing shop building but getting it up to par presents challenges. First off, I knew my stud spacing would be off a bit when I enclosed the porch area due to the existing posts and roof structure. During the week it was time to insulate the ceiling so that the drywall process can begin. Can’t figure out how the builder came up with the rafter spacing. Customary spacing is 24″ on center but these vary from 15″ to 27″ and leaves me wondering how the sheathing was attached for the roof. We’ve had rain and no leaks so at this point I’m leaving that alone. I purchased R-19 insulating batts which were fine except for attaching them. Check out the pictures, I ended up being able to staple one side and then cut filler pieces to fill gaps as needed. Not wanting to go to Home Depot for tie wire to support it until the drywall goes up I decided to try this yellow, mesh joint tape and staple it up as I went across the span. Best way to cut insulation: Pruning Shears! That worked out okay (itchy job!) and the insulation was extended all the way out into the 2′ overhanging eave. 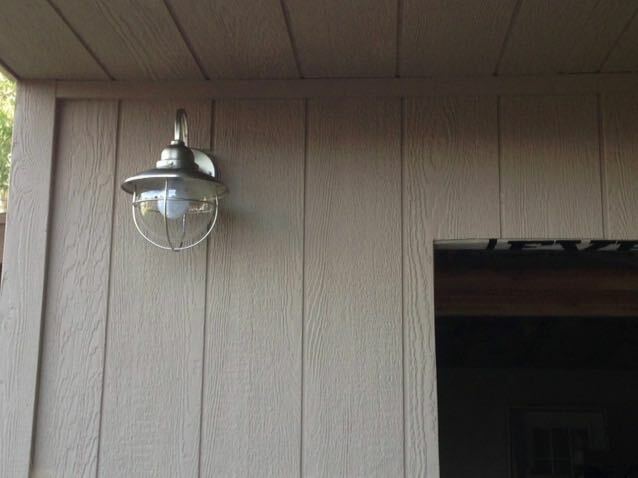 This was then boxed in with the same material used for the siding and capped off with the installation of this semi-industrial looking porch lamp. Now it was time to figure out how to attach the drywall to the rest of the ceiling in the main shop area. Monday was a great day, Wolfgang’s Air Conditioning and Service here in Phoenix came out and installed the mini-split system. It’s going to be so cool (no pun intended) to have a shop that is climate controlled. Here’s a few pictures of the progress, I did need to remove the rest of the drywall to complete the install. Cranked it up in the afternoon even though the windows and doors aren’t installed yet and it felt good. Super efficient, super quiet, 1 ton unit with a SEER rating of 29.3! In place and ready to chill! Speaking of drywall, after messing with it to remove all of the previous owners mistakes decided to check the budget and get some estimates on possibly having this job subbed out. The neighborhood we live in here in Phoenix has an historical designation as Rancho Ventura. There is a homeowners group (no HOA’s) that also has an on-line newsletter. After putting in a request for drywall finishers I contacted a man who happens to live on the next street. He has a drywall business called Kabco and came over as scheduled. To make a long story short, after getting a bid for just tape and texture I decided to ask him about hanging it as well. I liked the price and he and I have been working out there the last two days and getting along well. At this point all of the drywall is hung and he’ll be back to add the corner bead, tape, and texture. Without a doubt, had I taken this on alone it would be a 3 week job rather than a 1 1/2 week. My knees and back are thankful — many miles on this body running marathons and my 50 – 100 mile trail races have made climbing ladders and crouching down to cut drywall a less than delightful chore, really glad that hiring Kevin was in the budget. Almost done, just box beam and posts left. Final thing for this post is the progress on the window at the front of the house. You may recall from the previous post where I talked about all of the problems with it. Just came back from Home Depot and they told me that both the windows and doors are scheduled to be at the store by the end of the week. In any case, here’s that large window removed and the framing for its replacement of two, single hung windows instead. Still can’t understand why anyone would put in a large window with a structural post right smack dab in the middle of it — oh well! This entry was posted in Phoenix Woodshop and tagged Home Depot, KABCO drywall, Rancho Ventura. Bookmark the permalink. I particularly love the fact that you will have an air conditioning system. Those split units are amazing, and very, very economical. You will probably triple your productivity by being comfortable in your space. Nice job!